Objective: To work as many stations as possible on any and all amateur bands (excluding the 60, 30, 17, and 12-meter bands) and to learn to operate in abnormal situations in less than optimal conditions. 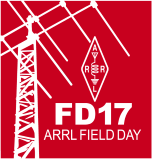 Field Day is open to all amateurs in the areas covered by the ARRL/RAC Field Organizations and countries within IARU Region 2. DX stations residing in other regions may be contacted for credit, but are not eligible to submit entries.